The UDC Chapter name is illegible. The other side of the marker is the same text but in much worse condition. Fort Buhlow and Fort Randolph were earthwork/moat fortifications constructed beginning October 1864 by Confederate forces anticipating a repetition of Union Gen. Nathaniel Banks’ Summer 1864 Red River Expedition. Construction, completed March 1865, was under the command of Capt. C.M. Randolph and supervised by a military engineer, Lieut. A. Buhlow, for whom the forts are named. The work was performed by about 1500 soldiers and civilian workers and 500 black slaves. A third and larger fort, planned for the Alexandria side of the river, was never built. There was a Confederate troop buildup in the Alexandria area in March 1865, and the Confederate ironclad Missouri was anchored in the river opposite Fort Randolph, but the anticipated attack never came and no fighting ever took place. On May 26, Gen. Simon Buckner surrendered all Confederate forces in the Trans-Mississippi, and Union forces under Gen. Philip Sheridan occupied Buhlow and Randolph on June 2, 1865. Fort Buhlow is located approximately 60 yards upstream (north) of the O.K. Allen Bridge on US Highway 71. Fort Randolph is located approximately 600 yards downstream (south) of the bridge. Erected by T. O. Moore Chapter of the United Daughters of the Confederacy. Location. 31° 19.633′ N, 92° 26.893′ W. Marker is in Pineville, Louisiana, in Rapides Parish. Marker is on Monroe Highway (U.S. 71/165) near Rainbow Drive, on the left when traveling east. Touch for map. Traveling on US71/US165 across the O.K. Allen bridge from Alexandria to Pineville. The marker is on the left, a few dozen yards from the bridge. Marker is in this post office area: Pineville LA 71360, United States of America. Touch for directions. Other nearby markers. At least 8 other markers are within walking distance of this marker. The Red River Campaign (approx. 0.4 miles away); Bailey's Dam (approx. 0.4 miles away); The Dam Works (approx. 0.4 miles away); Pierson Lake (approx. 0.7 miles away); Central Louisiana State Hospital Cemetery (approx. ¾ mile away); Red Hill (approx. 0.8 miles away); Mount Olivet Chapel (approx. 0.8 miles away); Pineville #4 (approx. 0.9 miles away). Touch for a list and map of all markers in Pineville. More about this marker. Both sides of the marker are inscribed with the same message and both sides have illegible portions at the base. Internet research identified the erecting organization as the Thomas Overton Moore Chapter (No. 640) of the United Daughters of the Confederacy. Regarding Fort Buhlow and Fort Randolph. This marker incorrectly states that Union General Nathaniel P. Banks' Red River Campaign took place in the Summer of 1864. In fact the Red River Campaign was in the Spring of 1864. More. 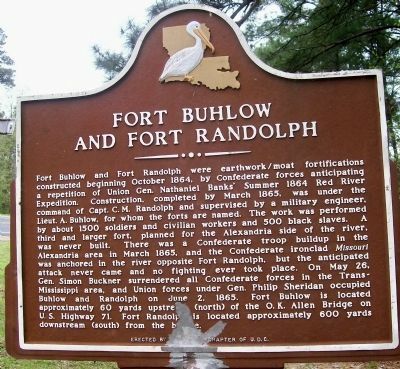 Search the internet for Fort Buhlow and Fort Randolph. Credits. This page was last revised on March 18, 2017. This page originally submitted on May 21, 2008, by Texmexfla of Houston, Texas. This page has been viewed 4,106 times since then and 28 times this year. Photo 1. submitted on May 21, 2008, by Texmexfla of Houston, Texas. • Craig Swain was the editor who published this page.